The other day I attended my lovely nephew Julian’s high school graduation. 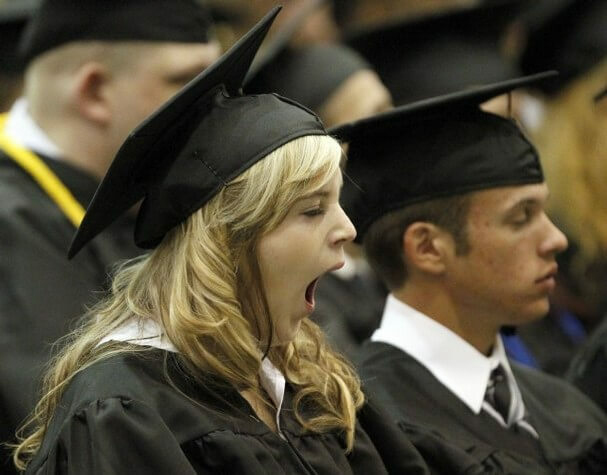 Ah, the joys of graduation! Where graduates wait in long lines, sit for hours on uncomfortable chairs, get sunburn, and listen to (mostly) boring speakers someone else chose. All to hear their name read amid hundreds of others, walk across a stage, and get a blank diploma (the real one is mailed later). And there’s more — your loved ones enjoy the same multi-hour experience, except they get to watch your fleeting stage walk from uncomfortable chairs a long way away! A graduation is an Elementary Meeting: a social event that consists of obligatory, tacitly agreed series of actions performed by those taking part. I’ve written about the power of Elementary Meetings to create original event designs — but some Elementary Meetings are poorly designed by today’s standards. Because they are a historic piece of our culture, we tend not to critically evaluate or rethink them. Instead we take for granted and put up with the ritual one more time.